Cisco Vs Huawei – Which One is the better Choice for Ethernet Switches? Cisco, as the big brother in the telecom industry, has dominated the market of networking devices (like routers and switches) for a long time. No one can compete with him. Huawei, however, is the rising star in Chinese market. It ranked 83rd in the latest Fortune 500 list on July 23, 2017. Many people assume that in the near future, Huawei will lead the world instead of Cisco. Thus, in this article, we are going to analyze the strength of Cisco and Huawei, along with the differences between Cisco and Huawei switches. 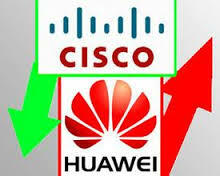 Both Cisco and Huawei are the relatively young enterprises, which are founded in 1980s. With 30 years’ development, Cisco was at the top of respondent edge/core router and CES manufacturer leadership scores. Cisco systems mainly offers networking devices, networking management, Cisco IoS/NX-OS software, storage area networks, wireless equipment, data center devices, and interface & modules, etc. The above table shows the basics of the two companies. According to Fortune 2017, Huawei, with the revenues of $78.5108 billion rank No.83 in Fortune 500 List, which is also the first time in the top hundred. Huawei is famous for mobile and fixed broadband networks. Recently, their optical switches, multimedia technology, tablet computers also wins the heart of customers. Ren zhengfei, founder of the Huawei Technology, once said, Huawei’s secret of success is our focus and dedication to our customers. Huawei will embrace a better future. 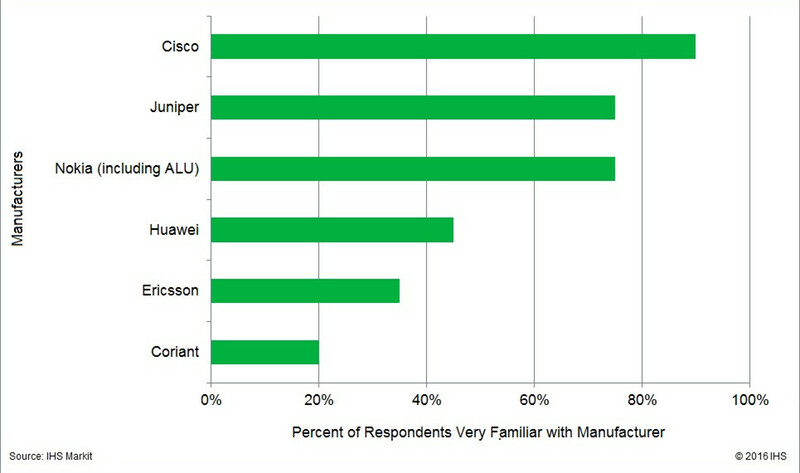 In the 2016 study, Cisco along with Juniper, Huawei and Nokia (including Alcatel-Lucent), form a top tier clearly separated by a wide margin from the other manufacturers. There was a big gap between these four and their competitors, with the sole exception being price-to-performance ratio. We ask carrier survey respondents to rate their familiarity of service provider edge/core router and /or CES manufactures. Looking at the individual manufacturer selection criteria, for technology innovation and product roadmap, Cisco and Nokia were numbers one and two, respectively. And for price-to-performance ratio, Huawei at number one. And for the above table, we can see Cisco drops share in router market; Huawei, Juniper gain & market is rising. For the full year 2016, Cisco declined 3.7% over 2015, while recording 57.0% market share (compared to 60.6% in 2015). In the hotly contested 10GbE segment, Cisco held 53.0% of the market in 4Q16, finishing essentially flat over the previous quarter. 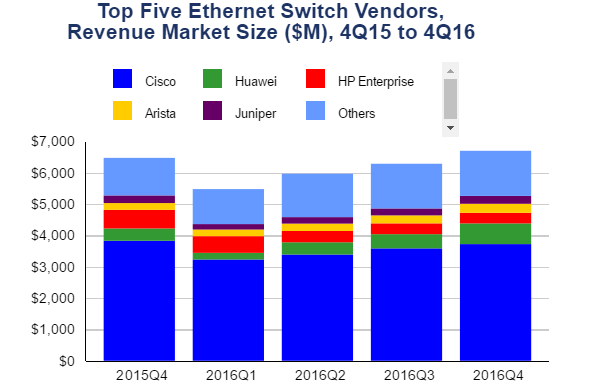 Huawei continued to perform well in both the Ethernet switch and the router markets. For the full year 2016, Huawei’s Ethernet switch revenues grew 61.8%, leading to a market share of 7.0%, compared to 4.4% in 2015. Why Would People Go for Huawei? The reasons that Huawei becomes so strong are not only due to the support from the government, but also because of its powerful local support capability. There are bugs in the high-end devices, and this is inevitable. If two Cisco engineers are assigned to solve the problem, Huawei can assign 20 engineers to fix it. Besides, if one major client like CT has customized requirements, Huawei can ask product engineers to work in the CT office as soon as possible, even Cisco cannot do this. This kind of quick response ability is obviously the advantageous factor for Huawei to exceed Cisco in its own home court. There is some relationship between Cisco Switch and Huawei Switch. So Cisco Switch or Huawei Switch? The following comparison simplifies the relationship of Cisco switch and Huawei switch, which can help you select the most suitable switch devices for your office, or company and organizations. The popular series of Cisco switches are the enterprise switches, Catalyst series and Nexus switches. Cisco Catalyst series includes 2960 series, 3650 series, 3850 series, 4500E series, etc. Cisco Nexus series includes 9000 series, 7000 series, 6000 series, 5000 series, 3000 series, 2000 series, etc. Cisco Catalyst switches are designed for core layers in campus network, while the Nexus is mainly for data centers. Nexus series switches can support Ethernet, Fibre Channel and FCOE all in the same chassis but the catalyst don’t. The catalyst switches support only Ethernet. Huawei switches also have various series, such as data center switches, campus switches and SOHO & SMB switches. The popular one is the campus switches. In all the campus switches, the S5700 series is the hottest switch. To have a further understanding, the following part will briefly compare Cisco WS-C3850-24T-L and Huawei S5700-28X-LI-AC switches. WS-C3850-24T-L is Cisco Catalyst 3850 24 Port LAN Base equipped with stackable 24 10/100/1000 Ethernet ports, and 350W AC power supply. S5700-28X-LI-AC is the Huawei S5700 series 10G switches, which are equipped with 24×10/100/1000Base-T Ethernet ports and 4x10GE SFP+ ports. To sum up, each Cisco Catalyst 3850 model, is similar to a S5700 model, or is equivalent to one of Huawei S5700 models, which will not be listed here. FS 40G/100G white box switches provide high performance, increased availability, low latency and better serviceability for next-generation data centers and enterprise networks in different applications. And they also support spine-leaf network topology that leverage commoditized hardware for the best price/performance, just as shown below. Besides the 40G/100G white box data center switches, we also provide a full series of compatible transceiver modules including the SFP, SFP+, QSFP+, SFP28, QSFP28, CFP, etc, which are compliant with major brand. Custom service is also available. Cisco Vs Huawei, we can’t say which one is better than the other. To be considered the No.1 choice for your network, Cisco switches meet the needs of organizations and offices of all sizes and sorts. As for Huawei, it has several product lines that are similar to Cisco devices, but have their own network hardware lines and IT solutions for different network demands. Besides Cisco and huawei, there are other brand that are also effective and reliable, such as FS enterprise Ethernet switches. For more detailed information, please direct visit fs.com. Ubiquiti Unifi Switches Vs Cisco Catalyst 2960, Which One Should I Choose? Recently, the hot debate between Cisco and Ubiquiti Unifi switches has aroused much attention. Data center managers reckon that Cisco catalyst series switch is undoubtedly the ideal choice than UBNT Unifi switches. While small enterprises have to choose the much cheaper Unifi switches. In the ideal world, they’d love to go with Cisco catalyst 2960, but with a limited budget, they can do nothing about it. So basically, this article will help you look for the best options between Cisco Catalyst 2960 and Unifi switches. Cisco Catalyst 2960 series switches are the layer 2/layer 3 edges, providing 10 and 1 Gigabit Ethernet uplink flexibility, Power over Ethernet Plus(PoE+) access connectivity for enterprise, midmarket and brand office networks. There are Catalyst 2960-S and 2960-X series switches. Cisco 2960-S is the previous layer 2 access switch with the switching capacity of 176Gbps, 2 20G or 4 1G uplinks and PoE/PoE+ up to 740W. Cisco 2960-X/2960-XR switches provides the convenience with layer 2 and layer 3 in a single switch with switching capacity of 216Gbps. 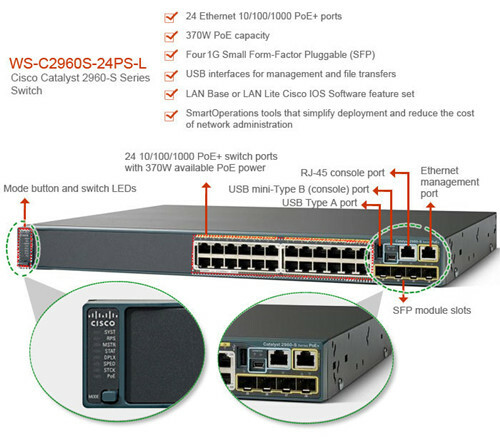 Figure 1 shows Cisco WS-C2960S-24PS-L switches and its features. FS.COM also offers compatible Cisco 2960 SFP modules, which are 100% tested assured. You don’t need to worry about the our Cisco 2960 x SFP compatibility. Cisco 2960 series supports gigabit access growth for wired and wireless/802.11ac, and more traffic through IP address scalability. And with PoE/PoE+ capacity, Cisco 2960 can be easily and rapidly deployed in many IP endpoints. Cisco Catalyst 2960 series switches provide optimum power savings, low power operations for industry best-in-class power management, and power consumption capabilities. The Catalyst 2960 ports are capable of reduced power modes so that ports not in use can move into a lower power utilization state. In all, Cisco Catalyst switches reduce greenhouse gas emissions and increase energy cost savings and sustainable business behavior. Cisco Catalyst 2960 Series Switches include the following features sets: Cisco EnergyWise technology, efficient switch operation, intelligent power management. Cisco Catalyst switching solutions enable greener practices through measurable power efficiency, integrated services, and continuous innovations such as Cisco EnergyWise, an enterprise wide solution that monitors and conserves energy with customized policies. Unifi Switches is fully managed Gigabit switch, delivering robust performance and intelligent switching for your growing networks. 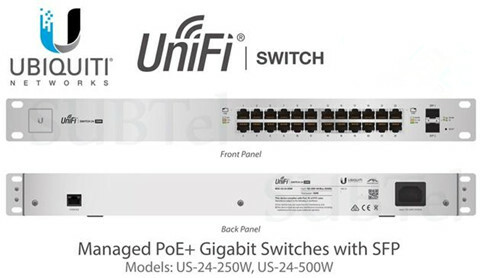 The most popular model of this Unifi Switches is US-24, US-48. According to Ubiquiti networks, Unifi switches have the four following features. Figure 2 shows the Uniquiti Unifi US-24-250W port analyst. For its total, non‐blocking throughput, the 24‐port model supports up to 26 Gbps, while the 48-port model supports up to 70 Gbps. What Features Does Cisco Switches Have That Are not Addressed by Ubiquiti? Very ala Carte on their service and components. Requires Prior knowledge of Cisco Networking. And configuration help from Cisco. Most will feed a good sized area but you have to configure for overlap. the controller is a small rack mount box and should be in your data center. Figure 3 shows the network plug-n-play with Cisco APIC-EM. What Are the Tempting Points of Unifi Switches, Except Costs? If you can program a home router you can set this unit up and the guest network with ease. The controller is software based and easy to install and move should the original crap out or need to be reworked. You can feed a good size office off of 2 of the Long-Range APs. the controller will handle the overlap for you. How to Make a Choice Between Ubiquiti and Cisco Switches? Cost: Price is the biggest incentive in most of the case. A general quote for ubiquiti and Cisco, the Cisco is typically 3 times the cost of ubiquiti. Considering the cost differences between Unifi and Cisco catalyst switches, what makes Cisco so pricey. According to many fiber optic technicians, the ubiquiti system will give them 99% uptime while the Cisco system will give them 99.99% uptime. Performance: Except the budget, another thing to add into the account is going to be bugs in the code/hardware failures. Within the telecommunication industry, you are not going to find much better, as far as stability is concerned, than Cisco. Support: With Cisco, you will get some of the best support in the industry. Ubiquiti Unifi switches are quite easy to install and manage. Their controllers are software based, which are quite easy to work with. Together, If your require a more secure, more robust solution to meet your enterprise and complexity needs, then Cisco is your best option. If you are small to medium sized company and are not trying to create a holo projection of the wheel at every desk. Ubiquiti will be a great fit and should more than meet your needs. FS.COM 1/10G Enterprise switches supports layer 2 switching capacity featuring Cumulus Linux, Intel Processor, Broadcom Chips, and 176Gbps switching capacity. Figure 4 shows the S2800 (24*100/1000Base-T+4*GE Combo) switches. Although there is exact answer to this question, I Insist that you ask several questions inner your mind before taking the next leap. Q1: Is what case would you absolutely need Cisco and Ubiquiti wouldn’t do the job? Q2: What features does Cisco products have that are not addressed by Ubiquiti? Q3: Is this the best solution for me? Can I use other branded switches like FS.COM? If you have any comment about this topic, please leave your notes with us. 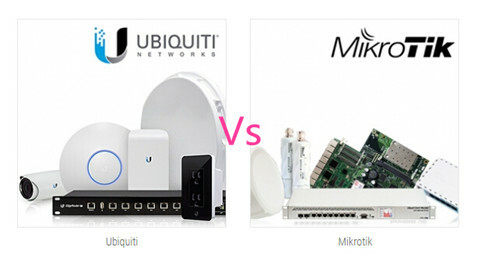 Mikrotik Vs Ubiquiti – Which One is Better for Home Network? Ubiquiti Networks and Mikrotik were the rising stars in telecom field for the past year and a half, I have heard various fiber optic technicians telling me that Ubiquiti is better suited wireless applications while Mikrotik is excellent at what it does best—routers. As the cheap and reliable alternative to Cisco expensive equipment, Mikrotik has a learning curve not many can endure and Uniquiti, famous for its 1G/10G Unifi Switches, also has its limits. So, how to make a choice between them? This article will offer detailed information about Ubiquiti and Mikrotik in terms of target markets, price point as well as their pros and cons, from the perspective of a long-time Ubiquiti and Mikrotik user. After looking around at their website, You must admit the Ubiquiti website is a bit better than the Mikrotik site. But, there is no way to say witch one is better? Each of them are making some unique products. Founded in 1996, MikroTik is a Latvian company aimed to develop routers and wireless ISP systems. Mikrotik offers a complete solution for wireless connectivity needs from the mANTBox, SXT, LHG, DynaDish to hAP AC. And they are also famous for their router devices. Mikrotik even launch the Mikrotik academy by expanding RouterOS learning possibilities for educational institutions. While Ubiquiti Networks is offering Unifi series devices and its wireless accessories. UBNT has Unifi series, setting up WIFI network could not be easier, range and performance is superior. For detailed information about Unifi switches and its compatible optical transceivers, please see this article. All in all, in noisy environment, UBNT is more stable and reliable due to its good antenna design, where Mikrotik devices are reconnecting constantly. Mikrotik have CCR routers, they are performing great, there was DDoS attack targeted to my customers network, CCR12G CPU where running at 80%, but did not crashed. UBNT Unifi Switches and Mirotik Routers are the hot selling products. Both of the two hardware providers are widely deployed in WISP networks, and their switches and routers are software based which are 1/10 or less of the cost of the equivalent Cisco/Juniper products. Ubiquiti offers an amazing price for wired speed switching, especially their Edgeswitch, Unifi switches, and Edgerouter. Their Edgerouter solutions seem to be faster than Mikrotiks solutions. 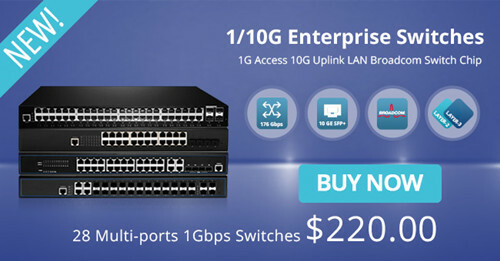 UBNT are no longer providing the Edgeswitch series switches. Ubiquiti UniFi Switch is available with either 8, 16, 24 or 48 RJ45 Gigabit ports at either 250 or 750 watts. The UniFi Switch delivers robust performance, PoE+ support, and intelligent switching for growing networks. The UniFi switch targets the Enterprise / SMB market, which is designed for a wider IT audience, and therefore, tend to be simpler, and easier to use. For its total, non-blocking throughput, the 24port model supports up to 26 Gbps, while the 48-port model supports up to 70 Gbps. 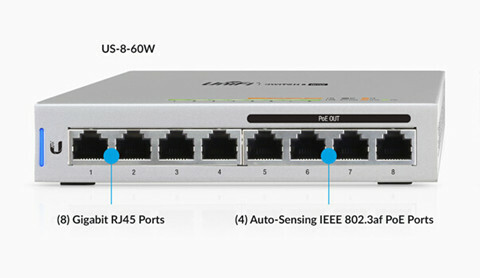 The above image shows the US-8 8-port managed Gigabit switches with PoE Passthrough. Mikrotik also makes routers and switches and supports advanced features such as MPLS. Ubiquiti routers use Cavium chips so they are not 100% software solutions, having a bit of programmable hardware support. Although most Mikrotik products are 100% software-based, their flagship router nowadays, CCR, also has similar hardware acceleration from Tilera. CCR1016 is an industrial grade router with a cutting edge 16 core Tilera CPU. The CCR1016-12S-1S+ seen in the below image, comes with redundant power supplies and one RJ45 SFP 10/100/1000M copper module. It has 12 SFP Ports and one SFP+ port for 10G connectivity. Wireless and BRAS-type solutions under RouterOS work fine, but routing has been a challenge since they moved from Quagga to XORP due to licensing issues; Mikrotik uses a lot of open source but published very little code, drawing extensive criticism from the open-source community. Although it’s unknown to me if they are still using XORP, whatever they use still has flaws. FS.COM, as an optical solution expert, provides Ethernet switches, enterprise WiFi, power cords, and video converters, etc. Our Ethernet switches are ranging from 1G to 100G. Just take S3800 series switches as an example, This switch features 24 Gigabit Ethernet ports, 4, 32 or 48 SFP+ ports and 40G/100G ports, which provides smooth upgrading to high-speed network. 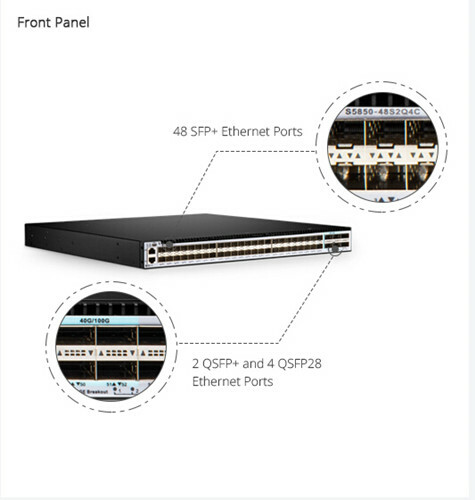 FS.COM S5850-48S2Q4C switch is equipped with 48 SFP+ ports, 2 QSFP+ ports and 4 QSFP28 ports providing 960Gbps non-blocking bandwidth and 1200Mpps L2/L3 throughput. Not only the Ethernet switches, we also supplies 100G QSFP28 transceivers, QSFP optical transceivers, SFP+ optics and data center jumpers with great variety and 100% assured tested. Customers can buy a whole series of devices in our online store. There is no winner between Mikrotik and Ubiquiti Networks, none of them are better or worse, there is different tasks and problems, and different solutions for them. Choose product according your needs, not by brand! Besides FS.COM would be a great option,too. Thank you for your reading, if you are interested in this topic, please leave your comment here.